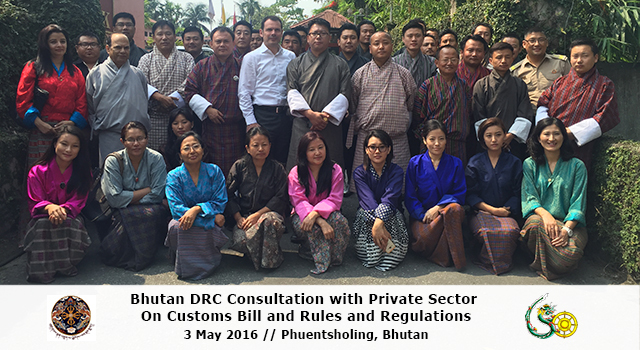 The Department of Revenue and Customs (DRC), Ministry of Finance, Bhutan conducted Consultations with the private sector on Bhutan’s draft Customs Rules and Regulations, on 3 May 2016 in Phuentsholing, Bhutan. Customs Rules and Regulations are being updated to ensure alignment with Bhutan’s new Customs Bill 2016, currently under consideration by the National Assembly. It is expected that – once ratified by the National Assembly – the Customs Bill will pass to the National Council for ratification in the winter session 2016. The Consultations familiarized private sector business and trade on proposed amendments to Customs procedures and practices, before the draft Customs Rules and Regulations are finalized. During 2015-2016, DRC consulted extensively with all relevant government agencies on the draft Rules and Regulations through a series of national workshops and one-on-one consultation meetings. DRC aims to finalize the Customs Rules and Regulations for implementation at the same time as the new Customs Act is expected to come into force in early 2017. The 3 May Consultation was attended by over thirty private sector participants, including the Bhutan Chamber of Commerce and Industry; Clearing and Forwarding Agents; State Trading Corporation of Bhutan; Courier Services and various business associations. Overall, private sector representatives welcomed the revision of the Customs Rules and Regulations, and provided useful feedback and recommendations in how to further improve existing Customs procedures and practices. Following review of all suggestions, necessary amendments will be made to the draft Customs Rules and Regulations. DRC Customs officials, including officials from the SASEC Project Management Unit, were involved in conducting this workshop. Mr. Sonam Dorji, Regional Director, Regional Revenue and Customs Office officially opened the Consultation, and highlighted DRC’s initiatives in ongoing Customs reform and modernization processes in Bhutan to facilitate trade, including amendments to the new draft Customs Bill. He stressed the importance of this Consultation with the private sector in developing robust and implementable Customs procedures, and the need for cooperation and support from all stakeholders. The Asian Development Bank through its Technical Assistance Special Fund financed this Consultation, providing logistical arrangements and support.